In 1887, Oscar Wilde wrote: “We have really everything in common with America nowadays, except, of course, language.” A similar quote is commonly attributed to George Bernard Shaw (“The United States and Great Britain are two countries separated by a common language”) but appears nowhere in his writings. Still, the theme is clear: although on paper we speak the same language, the English that the British and American people speak is often confusingly different. Take for example spelling: on this side of the Atlantic we love to mock the simplified American spelling of words like airplane and color/flavor (as opposed to aeroplane and colour/flavour). We giggle when Americans say “a-loo-min-um” foil for aluminium foil. And don’t even get me started on different words for the same thing! We say jam, they say jelly; we say trainers, they say sneakers; we say rocket, they say arugula; we say the car boot, they say the trunk. And then, more confusingly, there are words that look the same on both sides of the Atlantic, but denote different things – like biscuits (denotes scone-like baked items in the US but cookies in the UK) and muffin. The English muffin is said to have originated “below stairs” in the servant’s quarters of English stately homes. It is said that the cook wold take scraps of leftover bread dough and fry them on the griddle for the servants to eat. The result was a small, flattish, not-really-sweet, yeast-leavened bread that was traditionally split open and served warm with butter – and they were so delicious that soon everybody wanted them. Muffins gained huge popularity in the 1800s and in the Victorian era you could buy them from street from sellers who carried trays of them on their heads, ringing a handbell to alert customers to their approach. They are also hugely popular in the US where they are called English muffins (to distinguish them from the American variety to be discussed below) and form the basis of the McDonalds Egg McMuffin breakfast. The American muffin, on the other hand, is a different beast altogether . Unlike its yeasted English cousin, the American muffin is basically a quick bread baked in individual moulds and relies on a chemical leavening agent rather than yeast to achieve its moist, fluffy and altogether more cake-like structure. Chemical leavenings were not developed until the end of the 18th century when pearlash (a refined version of potash) was discovered to create carbon dioxide gas in dough; and commercial baking powder was not developed until nearly 1860. Because the are made from a fairly sloppy batter rather than a dough, the individual moulds were necessary to give them shape, and the leavening agent gave them their exuberant “muffin tops” that rose above the muffin tin. Today, muffins come in a range of savoury and sweet flavours and are enthusiastically enjoyed on both sides of the Atlantic. As an extremely lazy baker, I am a great fan of baking muffins in the American style. 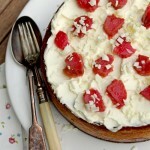 They require none of the faff of yeasted baking – no kneading, rising, proofing, knocking back or any of that nonsense. If you decide at 10pm at night that you feel like freshly baked muffins, you can be feasting before midnight! 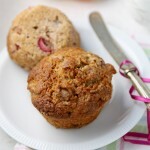 Growing up, the muffins that my mom made most frequently were raisin bran muffins, with the occasional carrot muffin for variety – but when I arrived in the UK a whole new world of muffins opened up before me, stuffed with everything from berries, to pumpkin pie flavours to chunks of caramel or chocolate. Much as I like chocolate, I have to say that I always like an element of fruit in my muffins, but why not enjoy the best of both worlds? 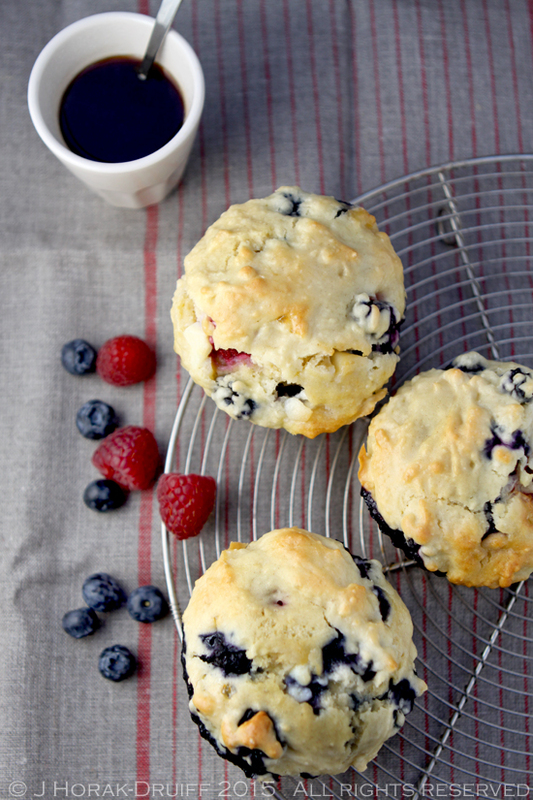 These glorious berry-filled muffins come with the added surprise of chunks of gooey white chocolate, both to take the edge off the tart berries and to add a touch of indulgence. If you are into low-fat, low-sugar, high-fibre or anything virtuous, avert your eyes now 😉 Everybody else – dig in! These berry-laden white chocolate chunk muffins combine the best of both world: healthy berries with decadent chocolate - and they are ridiculously easy to make! Pre-heat oven to 200C. Grease a standard 12 cup muffin tin or a 6 cup jumbo muffin tin (or use individual silicone muffin cups). Mix the flour and baking powder together in a large bowl. Using your fingertips, rub the butter into the flour mix until the mixture resembles fine breadcrumbs. In a separate bowl or jug, mix together the milk, eggs and vanilla extract. Pour the egg mixture all at once into the dry ingredients and mix briefly until just combined (do not overmix!). Stir in the sugar, berries and chocolate. Spoon the batter into the prepared muffin cups. Bake in the pre-heated oven for about 20 minutes or until golden (test with a skewer - when a skewer inserted into the centre comes out clean, the muffins are done). Allow to cool for 10 minutes, the turn out onto a wire rack. These are delicious both warm and cold, but if you catch them warm, the chocolate will still be melty! You can also find me tweeting at @cooksisterblog, snapping away on Instagram, or pinning like a pro on Pinterest. To keep up with my latest posts, you can subscribe to my free e-mail alerts, like Cooksister on Facebook, or follow me on Bloglovin. They look so delicious, Jeanne! 🙂 Love your food photography! I love fruity muffins and your’s look divine and the addition of chocolate is always a winner! Hahaha… Those confusing English words indeed. I guess I sort of use it as a jumble as I never really know which English I am typing. 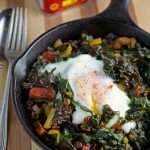 So I might use savory the one time and than savoury the next. It’s one of those things that always gets me confused. Why not simplify I wonder?? Now this muffin I can relate to. It looks gorgeous and I love the no fuss simplicity of the simple muffins! Yes, we know the Muffin Man …….. These look like perfect muffins, so moist! White chocolate and berries is always a fantastic combination. Cooper and I made choc chip pancakes today, but I think we will be making muffins tomorrow. I’ve not made them in such a long time, but they are so simple and so good. You’ve put me right in the mood now. Stumbled, pinned, tweeted, yummed and noted for tomorrow. A great post. Those muffins look delicious. A summery delight. I can’t remember when I last had an English muffin – certainly all the muffin sin my life these days have been the American sort, thrown together any time the kids have friends over or any time there’s a bake sale for school. It’s nearly mulberry season here, which means berry muffins every other day, so maybe I’ll try your version and see how they fare with white chocolate, even though dark chocolate is my vote! For years we would have a ritual of muffins for breakfast at weekends and I would think up a new flavour each week, it’s been a bit eclipsed by the waffle machine lately. I Must get back to making muffins. what a fab muffin – so packed with great flavours!